Several graduate and RN to BSN nursing students from Allen College served Iowans at the 7th annual Iowa Mission of Mercy clinic at the Five Sullivan Brothers Convention Center on Friday and Saturday, September 26 and 27. The clinic is open to all those who cannot a­fford dental care. Services such as dental cleaning, dental fillings, root canals, and dental surgery were performed with the help of dentists, dental students, hygienists, dental hygiene students, and many others who volunteered their time to serve at the clinic. 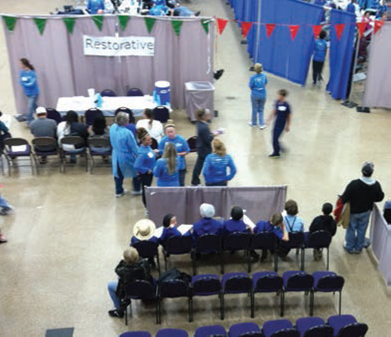 Over 1,102 patients were anticipated to have been served over the two day event. Those serving at the clinic included Allen College graduate students Lisa Goodfellow-Mertens, Meghan Cain and Anne Jones; RN-BSN students Angie Ames, Kim Porterfield, Marcia Corson, Nicole Wilkens, and Valerie Hileman; and Allen College faculty Tonya Enright and Denise Pralle.